Ever since the breaching of the Milltown Dam last March the confluence area of the Clark Fork and Blackfoot Rivers has been in constant flux. 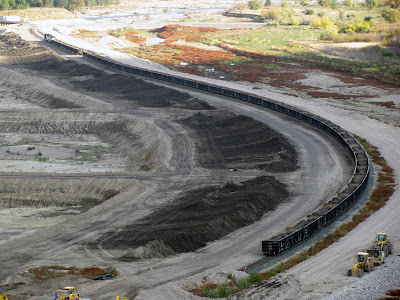 Excavators and haul trucks operating, trainloads of contaminated sediments running 100 miles upstream where additional excavators and haul trucks work in reverse at the other end of the watershed, spreading Milltown wastes atop the old Opportunity Ponds tailings. Mother Nature is into it full-board too, carrying tons of sediments and woody debris downstream from the Blackfoot and Clark Fork Rivers, springing up new riparian growth along sandbars and stream banks and sending trout and other fish up past the confluence for the first time in more than 100 years. It’s a busy and exciting site, progress in perpetual motion. In fact, from the Milltown bluff viewing site, the whole process looks something like ants at a big picnic where there’s never a shortage of food, not even for one minute. The CFWEP is pleased to give an update on our own progress in making sure Missoula, Bonner and Anaconda kids are taking it all in. In its first year of operation in Missoula, the CFWEP is working with Missoula schools to offer the Milltown Dam Education Program. It was only fitting that the first school to go through the new and improved Milltown program be the one closest to all the activity. Sean Kiffe’s 7th graders from Bonner School kicked off the 2008-09 school year in October. Since then, Sussex and St. Josephs in Missoula have taken part, with four more Missoula schools set to visit the site in the spring. Carlton Nelson’s 7-8th graders from Anaconda will finish out the fall Milltown field season the week of November 17th. If you’re a scientist interested in lending a hand or just coming out to observe, please feel welcome and contact CFWEP at mvincent@mtech.edu or at 406-496-4832. 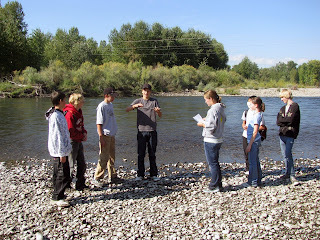 The Milltown program includes three days of classroom lessons and hands-on activities with students and one full-day field trip visiting Milltown, the Clark Fork and the Blackfoot River to see what’s going on, both with their own eyes and with science. To that end, students take on the role of riverine scientists for a day, starting by spending a half-hour at the bluff with one of the many professional scientists and engineers working on the project. Professional scientists who have worked with the students on the project to date include Doug Martin (Natural Resource Damage Program), Ben Johnson (Envirocon), Mike Kustudia (CFRTAC), Chris Brick (Clark Fork Coalition) and Mike Bader (Bader Consulting). From the bluff, it’s all about the students doing science themselves, led by a team of top-notch University of Montana graduate students working with Dr. Vicki Watson’s Environmental Studies program. Activity stations at the field study sites include water quality, macroinvertebrates, riparian vegetation and sediments and morphology data collection. The University student all-stars who have worked tirelessly with CFWEP in the development and implementation of the field and classroom program are Amy Edgerton, Katie Makarowski, Kelley Garrison, Bethany Taylor, Christa Torrens, Charlie Larson and Sarah Hamblock. Thanks to all who have helped make this program a success so far. And if we haven’t seen you yet, we’ll look forward to this spring! If you’re a teacher, don’t forget to mark your calendar for Friday and Saturday, February 6-7 for the CFWEP’s next Milltown Dam Education Program Training Workshop at the Bonner School. Participants will receive a $200 stipend and are eligible for 18 OPI renewal units. Again, visit http://www.cfwep.org/ for more information or contact Matt Vincent at 406-496-4832 or email mvincent@mtech.edu. The photo above shows a train loaded with contaminated sediment at the dam site. The area to the left of the train is the former reservoir, where workers are currently excavating sediment that was contaminated by historic upstream mining and smelting from Butte and Anaconda. The area to the right of the train is the former channel of the Clark Fork River. The river has currently been rerouted as part of ongoing remediation and restoration work.